Multicolor ribbon lights indoor/outdoor Professional Grade. Specifically designed for contractors and tradesmen wanting brighter lights, added reliability, and ease of connectivity. Higher voltage and heavy copper gauge significantly reduces voltage drop. The results are improved consistency of brightness and color throughout the ribbon. 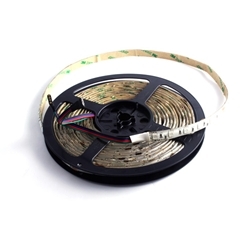 CYRON RGB ribbons offer great ease of installation for long linear runs. 3M tape transfer on the back for easy peel and stick. Can be cut every 4 inches. Compatible with all CYRON RGB controllers. Additional adapters may be needed. Using True-Colors LED technology, the red, green, and blue elements are packed into one element for the ultimate color convergence. For instance, if LEDs are viewed directly, the combined colors such as red/blue will look purple, not individual red and blue dots.